Does your health require a big time investment? It seems silly to think of a programmer injuring himself at work, but it happened – and it scared me. I neglected my health and I developed tendonitis in my wrists. The scare caused me to go the other direction: At one point I was doing 60+ mins of exercise every day. But I’m a freelancer with 3 little kids. Between running a business and being dad, I don’t have much time to spare. 60 mins a day was unsustainable. I needed results in less time. After searching, I found what I was looking for. This article is an explanation of an exercise methodology known as High-Intensity Training (HIT for short). If you’re interested in the “why” of HIT, read on. If you’d just like to know how to do the exercises, you can read the disclaimer and then go to the section on how to do High-Intensity Training. If I said you only need 15 minutes of exercise per week, would you laugh? I did. With the popularity of high-volume exercise programs like P90X, CrossFit and Bootcamp, the fitness mainstream is moving to more exercise. When my parents told me about their 15 minute workout program, I mocked them. I was 25 years old, working out 1 hour every day. 15 minute workouts sounded like fitness snake oil: A marketing trick to steal old people’s money with empty promises of minimal effort. A friend of mine is a trainer at a 15-minute facility. He preached the benefits of High-Intensity Training. He refuted my objections to his program. I decided to give it a try, and scheduled my first appointment. After all, it’s only 15 minutes. What did I have to lose? How much could you do in 15 minutes, anyways? After only 15 minutes of weight lifting, I was utterly fatigued. My legs were shaky to the point where I had trouble stepping down a curb to my car. Then, I reached to put the key in the car and my arm stopped short from exhaustion. There is a revolution brewing in exercise. I know the revolution is happening because I talk to converts every time I go to work out. They’re business owners and busy parents. They’re young and old (there is a 90 year old training at my facility). Many of the clients where I train are long time customers – 3, 5, 8 years of training the exact same way. Some drive long distances: 1 hour commutes to exercise for 15 minutes. When you realize how effective those 15 minutes are, you can’t go back to regular workouts. The revolution is moving exercise to simplicity. Simplicity for people who are too busy to spend hours at the gym. Pragmatic folks who want to be healthy, but don’t want to sacrifice their business, family, or hobbies to be in excellent shape. I am not a fitness expert. I can’t guarantee the methods in this article will work for you. I can only attest to the effectiveness of this method for me and several family members and friends. I’m not selling supplements. There are no affiliate links. This is one man’s experience explained for the benefit of those who haven’t heard of High-Intensity Training (HIT). HIT is particularly effective for parents, freelancers, self-employed, or other crazily busy people, but it can be done by anyone. Short Version: If you lift weights slowly and avoid micro-rests during repetitions, your muscles exhaust quickly and you get results faster. By focusing on results instead of time spent, you spend less time exercising and have more time for things you love. Warning: You should only start a training program if your health permits it. If you’re unsure, please talk to a doctor. High-Intensity Training is…intense. The modern approach to exercise isn’t very practical. Want to lose weight? Spend extra time on the treadmill. Want to get stronger? Spend more time lifting weights. But you don’t think this way with the rest of your life. Spending more time or doing more work doesn’t necessarily mean you’ll get better results. If you’re a programmer, you prefer to solve problems with less code. If you’re a writer, you prefer to explain yourself in fewer words. At the very least, you don’t want excess code or too many words. Would anyone prefer to do more chores to keep their house clean? Are we doing exercise wrong? How can I make this trip take at least 4 hours? When you’re trying to reach a destination, you take the shortest route that takes the least amount of time (unless you want a scenic route – that’s another story). The goal of exercise is to break down your body in order to trigger your body’s rebuilding mechanisms, which (if you’re healthy) will rebuild you stronger than they were when you started. Put simply, the goal of exercise is breaking down our body so it can build itself up stronger. We should pause to define some terms that are often used interchangeably, but mean very different things: fitness and health. Differentiating between these two is critical for understanding the role of exercise. Health is a state of physiological balance between the body’s biological breaking down (catabolic) and building up (anabolic) mechanisms. Fitness is the body’s ability to handle physical exertion. People who are fit are not necessarily healthy. This is well illustrated by the Greek story of Pheidippides. Pheidippides was sent to Sparta to request help when the Persians launched an attack in Marathon (a Greek city). 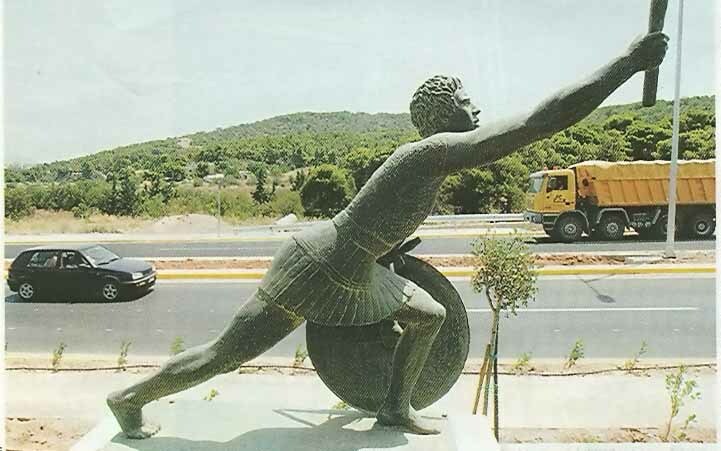 He ran 150 miles in 2 days to request the help, and then ran 25 miles from Marathon to Athens to announce the Greek victory: νικῶμεν, “we have won!”. After his announcement, he dropped dead. You could say that Pheidippides had great fitness, but terrible health. Being dead is bad for fitness and health. For the average person, being in good health is much more important than having good fitness. Not everyone wants to be a good runner, athlete or weightlifter. However, you probably want your body to be strong & healthy so you can do the things you love (which may include running or weightlifting). It’s a subtle difference, but it changes how you think of exercise. Your goal isn’t to get good at weightlifting, running, or sports – your goal is to get healthy. Skeletal muscle is the largest organ in your body, but you probably don’t spend much time worrying about your muscle health. The benefits to having increased skeletal muscle mass are numerous. You probably know a little more muscle would be good for you. You’d be stronger – that’s good! I’ll add my personal experience: Adding muscle makes you feel better. I type on a keyboard all day (I’m a programmer). I used to suffer from tendonitis and achy wrists. I tried stretching and ergonomics to no success. Once I started weightlifting, the aches went away. I’m not a biologist. This explanation is extremely simplified, but let’s cover the basics. You need to convince your body to build more muscle. To build muscle, you need to trigger your body’s synthesis (building-up) processes. Weight lifting stimulates muscle growth by causing stress to your muscle fiber, which triggers your immune system to rebuild the muscle stronger than it was before. The body’s rebuilding reaction is triggered primarily at the point of fatigue, when the body begins to run out of fuel to feed the muscle’s activity. If you want to build muscle mass, do 2-3 sets of 6-8 repetitions. If you want to build muscle endurance, do 3-4 sets of 8-12 repetitions. It turns out, both of these are misguided. If you want to build muscle mass and endurance, the important thing is to reach muscle failure. But you can reach muscle failure in 1 set. In studies comparing single-set exercise to multi-set exercise, there were little or no strength or health benefits linked to performing multiple sets. You can get the same benefits in a fraction of the time by increasing the intensity (and decreasing the amount) of your exercise routine. In fact, the trainers who use the High-Intensity method prefer to measure time under load (TUL) to repetitions. TUL is simply the number of seconds your muscles were bearing the weight of the lift. As you’ll see in the sections on doing the exercises yourself, High-Intensity Training reaches high TULs quickly because you don’t take breaks when you’re lifting. How dangerous is your workout? Injuries can happen in an instant (think sprains or muscle pulls) or over time (think of shin splits or tendinitis). There are 2 factors that affect your chances of injury: How risky your exercise is and how long you do it. For example, think of high-variety workouts like CrossFit, where rope-climbing is part of the regiment. Though awe-inspiring, even the safest rope climber risks significant injury; especially so when his climb follows other exhausting exercise. How long plays a big part in injury, as well. If you’re a long-distance runner, the likelihood of injuring yourself on a particular step is small, but you’re taking a lot of steps. The longer you run, the more likely you are to twist your ankle. But more important than twisting ankles is the repeated strain you’re placing on your ligaments and tendons. Obligatory note: I’m not saying you should stop running or doing CrossFit. I’m just pointing out that by doing so, you’re increasing your risk of injury. If you knew that, awesome – carry on. Free weights could have some advantages, but they’re easily misused by novices. You can drop weights. You can use poor form and strain joints. If you’re not a fitness nut and want to limit injuries, weight machines might be a good fit. Weight machines, while not perfect, substantially reduce the risk of injury. I’m pretty sure that’s why most gyms are covered wall-to-wall with machines (with a single rack of free weights hidden in the corner): Gyms want to reduce injuries and limit liability. Nearly every exercise program will call itself “high intensity”, but what they really are is “high volume” – you do lots of exercise, but very little of it is actually pushing your body to it’s limits. Let’s get down to it: How do you train the High-Intensity Training (HIT) way? Essentially, HIT involves performing ordinary exercises at an extremely slow pace – 10 seconds down, 10 seconds up for a single repetition. No pauses or rests are taken between repetitions. For example, on a standard push-up you would never extend your arms to the point where your muscle isn’t supporting your weight. Because muscles are engaged constantly during a HIT workout, they’ll fatigue extremely quickly – with the goal being fatigue after approximately 5 repetitions. HIT places heavy emphasis on the final bit of exertion, when your muscles are fatigued and you feel like quitting. With HIT, it’s never about lifting X pounds or doing N repetitions – it’s about quickly exhausting your muscles. For average people, HIT offers one significant advantage over other forms of exercise: It doesn’t take much time. A typical HIT workout takes 15 – 20 mins, and can be done once or twice a week (depending on how hard you push). With HIT, you can work out once a week for 15 minutes and see considerable strength gains. There is plenty of literature on the subject (much of it quite scientific). As a start, you can read Body by Science. For me, my family and my friends, HIT has worked a strength miracle. I have never been this strong in my life, and I used to spend 6-7 hours per week in the gym whilst eating Weight Gainer 5000. I never saw the results I’ve seen in 15 minutes per week – neither strength nor muscle mass has been greater my whole life. Sorry, I don’t do before/after pictures. You wouldn’t want to see it anyhow. Trust me. Weight machines are the ideal way to try HIT. They’re safe, help with consistent form, and are easily adjustable. However, the technique is essentially the same between free weights and machines, so you can follow these instructions with whichever you prefer. For each exercise, your goal is to reach muscle failure with 1 set of approximately 5 repetitions. Each repetition will go from just past starting position to just before full extension. You don’t want to disengage your muscles at any time during your repetitions. 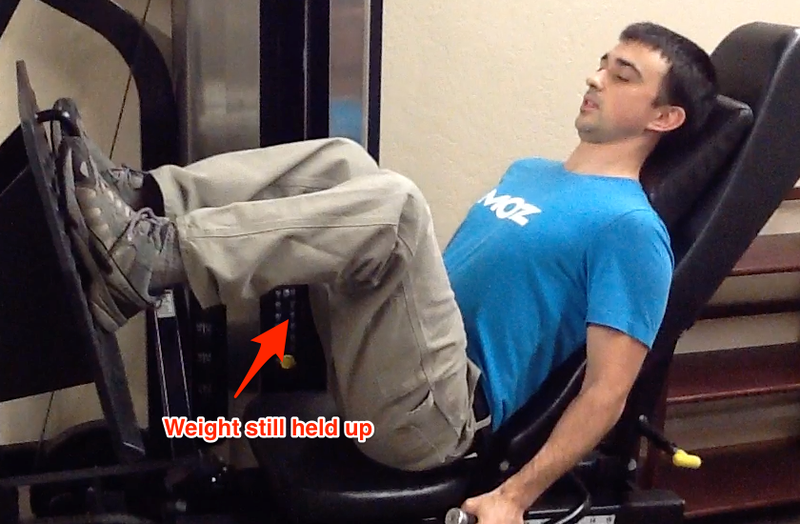 Here is a video showing a full repetition of a leg press. You probably won’t pick the right weight the first time. That’s fine. If you put too much weight, stop exercising, reduce the weight slightly, and restart. If you put too little weight, you can continue doing repetitions until you reach muscle failure. If you put far too little weight, stop and adjust the weight. Again, you’re shooting for 5 repetitions, but 4 – 7 is a good range. For extra effectiveness: On the last rep, do a 5-second pause holding the weights just above “resting position”. If you do this right, your muscles will actually shake as failure sets in. When you’re done with each exercise, write down what you did. Adjust next week’s workout according to what you wrote down. You don’t need weights to do HIT. Though weights will help, there are some exercises you can try at home with minimal equipment to get a sampling of the method. Though not completely necessary, a metronome will help you pace your exercise. Here’s a free online metronome (use the 60bpm setting to count seconds). Here’s a video of a push-up rep.
Get into standard push-up position with your hands shoulder-width apart. Put your knees on the ground (trust me). On the descent, count 10 seconds using your metronome. Stop an inch before your nose touches the ground. Start pushing back up. Count 10 seconds on the way up. Stop before your elbows lock. Begin going back down. Repeat until you can’t push yourself up any more. This is important – don’t quit early. Get to muscle failure for maximum effect. The best form for body squats is as if you were sitting down on an imaginary chair. You want to be pushing through your heels (not the ball of your foot), but this is difficult to do while balancing. To help, you can hold on to a counter, wall, or heavy piece of furniture and “lean back” a bit – just try not to cheat and use your arms to pull yourself up. After you’ve done your body squats, you can “finish off” your legs by doing a wall sit until your legs can’t bear it any more. A video explains it pretty clearly: Do your pull-ups slowly. 1 slow rep is better than 10 fast, if it exhausts your muscles. If you already have a weightlifting routine you enjoy, you can still add elements of HIT into your workout. It’s fairly simple: Do weightlifting exercises slowly. Don’t let your muscles rest between repetitions. That means you don’t fully extend arms & legs – keep the weight suspended on the up and down motion of the exercise. Your muscles will fatigue much faster, and you’ll get the excellent benefits of muscle failure in less time. Eventually, you’re going to need a trainer. If you’re doing the exercises right, your body will want to quit after 2 reps. A trainer will push you to finish all 5, even when you don’t believe you can. HIT training isn’t cheap. And I’m a tightwad. I view it as an investment – the trainer helps me get more out of my time. I know it’s true because I’ve felt the desire to quit, and the only thing that kept me going was my trainer. If you need help finding a HIT trainer in your area, let me know and I’ll do my best to help. HIT goes against some mainstream fitness ideas. It might seem gimmicky. Here are some common objections and answers. I don’t profess to know a lot about fitness, but if you have any other objections I’m all ears. 1. You can’t possibly get a good workout in 15 minutes. If you say this to a HIT trainer, their eyes will light up. I’d bet they’ll even offer you a free training session so you can decide for yourself. You have to experience it. 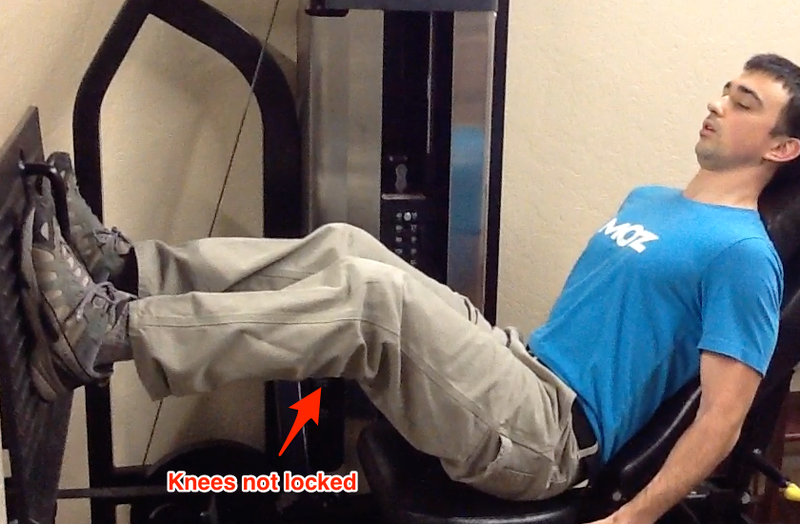 You will walk out of your workout on wobbly legs. Stepping down curbs will be a challenge. 2. Free weights are better. Why are you recommending machines? HIT is designed for average people. Average people don’t need free weights to get the majority of the strength benefits of weight lifting. 3. This doesn’t include Cardio. Don’t you need to do some running in addition to weightlifting? This will be controversial. If you’re a cardio fanatic, skip the next paragraph. You’ll have to check out Body by Science for the complete answer, but the short answer: No, you don’t need cardio. You get plenty of heart activity during a HIT workout, and it’s worth asking: Is it a good thing to make your heart work hard for a long time? HIT may not be for everyone. I know folks who tried it and will never return. It was too exhausting. Or it was too mentally intimidating (they didn’t like having someone pushing them). I wrote this article because HIT changed the way I exercise and raised my health levels to a place I’ve never been before. For the right person, it’s life-changing: Finally, you have the time to build strength and be healthy, and you don’t need to sacrifice other parts of your life to do it. I’d love to hear your questions or feedback. Message me on Twitter or Hacker News. 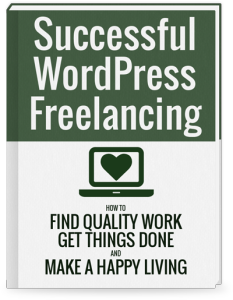 great post on a subject not talked about much in freelancing circles: health. im off to try the pullup / pushup versions! Great article! I was looking for a full length super slow exercise video with free weights and could not find one. Your article helps me to structure my own. I prefer free weights because I would rather do this at home, but I understand how the approach is easier with machines. I think super slow is perfect for me. The combination of arthritis and lower back issues has me questioning my fast-paced cardio and standard weight classes. I need something that allows me to go at my own pace. For me the slower the better. I’ll give it a go on my own at home, then progress to the gym and then maybe enlist a trainer! Thanks for the detailed guidance.